Want to get rid of facial hair forever? In our spa beauty salon we use only luxury cosmetic brands Sothys Paris (France) and ComfortZone (Italy). At Beautyshape Center in Prague you can indulge yourself with luxury skincare treatments from both Sothys Paris and Comfort Zone cosmetic brands. All the treatments are only done by certified cosmetologists with at minimum 8-year experience in the industry. Certified instrumental skin analysis and skin recommendation for the whole year! You spend hundreds or thousands of crowns every year on skin care? Are you sure what your skin really needs and how to take care for it properly? Put yourself in professional hands and try BeautyShape's certified American skin analysis device. Our analysis of facial skin shows the current state of the client's skin - not only the surface but also in the deeper layers, which are not visible to the naked eye. This device allows us to create a special program for your regular skin care. The treatment takes 30 minutes and contains of a skin analysis that includes the detection of hydration in the skin. This treatment can uncover hidden problems such as: pigmentation, sun damage, dehydrated skin, enlarged pores, acne, oily skin zone, the accumulation of dead skin cells, dark circles around the eyes, dry area around the eyes, wrinkles. Incl. skin analysis, a exfoliation, a ultrasound deep cleaning of pores, mask and cream based on skin type. ComfortZone is a complex spa project, developed by Italian company DAVINES Spa is located in Parma, Italy. Proven world’s leading quality of products by obtaining the «Best Spa Cosmetics Spa in European» and Asian Spa Awards in 2006 and 2008». 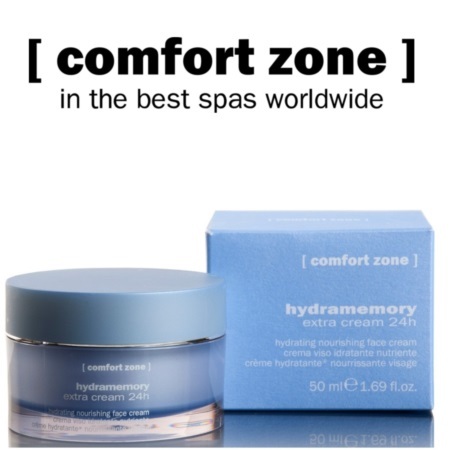 ComfortZone is used in luxury beauty salons, spas and declared the best hotel chains like Hilton, Intercontinental, Ritz-Carlton, Four Seasons, Sheraton, Hyatt. ComfortZone provides exceptional results and long-term care for your beauty. This treatment is also an unforgettable sensory experience. Treatments provide a deep relaxation with visible and long-lasting effect against signs of aging. They include anti-stress aroma ritual, oxidizing cleansing, nourishing facial massage, neck and hands, application intensive rejuvenating masks, skin treatments and final cup of herbal tea at the end. The therapist will recommend treatment program in order you can reach the ideal rejuvenating effect. Intensive hydrating treatment for face, neck and decollete with Biomimetic fragments Hialuronic Acid and marco hialuronic Acid, for a bright and silky skin aspect. The exclusive application of the mask with bruches offers a unique experience. Provides: 24hours double hydratation, +56% increase of skin hydration, helps to prevent the visible signs of a premature aging. Equalizing and strengthening treatment for sensitive and delicate Skin. Finally something for those who thought they could never have a facial experience! Smooths and restores the protective skin barrier through a delicate dermal-affinity action. BENEFITS: Renews and smooths the skin, Soothes redness and irritations, nourishes and fortifies the skin barrier. Recommended for skins which are sensitive, fragile and prone to redness. Deep purifying and regenerating treatment includes a special mask with Spirulina Algae. This transformational facial treatment utilizes the healing ingredients of green clay, algae, extracts of sage and ivy, also containing hero ingredients like extracts of pineapple, grapefruit and lemon. This luxurious treatment will leave pores noticeably minimized and the skin velvety smooth to the touch. A dream come true for those with oily and/or acne prone skin. Package Active Pureness 2+1 for half a price - save up to 950 Kč! Package Active Pureness 4+1 for free - save up to 1900 Kč! Innovative rejuvenating deep peeling with fruit acids renews skin texture, smoothes and unifies the skin color. This facial is an anti-ageing and lifting treatment for the face and neck. Combined with specific lifting massage moves and an innovative mask, this facial restores fullness to the skin and redefines the volume of the face. A 3in1 treatment which resurfaces, redensifies and lifts. Combined with exclusive active lift massage, it stimulates cellular renewal, bestows fullness and redefines the volume of the face. This is obtained through the double peel, followed by an innovative lifting and firming mask. This facial resurfaces and stimulates cellular renewal. The double peeling combined with vitamin C guarantees an illuminating effect on the face, neck and décolleté. Package Skin Deluxe Lift (90min) 2+1 at half price - save up to 1 485 Kč! Whitening, lightening anti-spot treatment. This treatment will greatly increase skin luminosity and provide oxygenating action. A long-term program will progressively lighten hyper-pigmented areas and restore an even tone. Results: Glowing skin, decrease appearance and prevention of dark spots, uniform and lighter skin color. Sothys Paris belongs to world’s exclusive cosmetic brands. It is the Signature of Excellence in Professional Skin Care. Setting the standards of professional beauty care for more than 60 years –SOTHYS is renowned for bringing advanced skin care and expertise to consumers exclusively through professional spas worldwide. From Paris and across the globe. Sothys is dedicated to the Beauty Industry. A global brand that transcends continents and cultures, represented in 20,000 spas in over 115 countries worldwide. Tailor made skincare treatment based on your skin needs. Maintains and protects different skin types. Each treatment includes: make-up removal, peeling according to skin type, massage, serum, mask, day cream, basic make-up. The TRI-COMPLEX ™ which combines two botanical active ingredients, Saffron and Sophora to fight against oxidative stress and free radicals, with new generation peptides (Matrikines) that provides an injection free solution to plump & firm the skin for a younger looking complexion and long term fix for aging skin. A professional treatment, allying Digi-Esthetique technology with an exclusive modelling technique for a proven and long lasting efficiency. *Test conducted on 41 people who received 3 treatments. Opinion expressed by 90% of people, considering they have obviously won 6 years on signs of age. Package 2+1 for half a price - save up to 1 175 CZK! Package 4+1 for free - save up to 2 350 CZK! Intensive moisturizing treatment provides superior hydration for all skin types. It comprises potent mushroom extract 1055 + synergistic moisturizing actives for maximum hydration of the skin. Extract stimulates the production of foals 1055 filaggrin. This key protein significant effect on the hydration of cells. This luxury treatment was specially designed to meet the hydration needs of all skin types, with a special six-phase protocol, exclusive Digi-Esthétique® modelling techniques and the latest generation of hydrating active ingredients. Results: revitalized, supple and moisturized skin. 71% increased skin moisture levels after one treatment! Youthful appearance! 80% of people confirmed that their skin looks younger. An innovative range of cosmetic moisturizing HYDRADVANCE Sothys won "Golden Cup Interbeauty Fair Prague 2012". Package 2+1 for half a pric - save up to 1050 Kč! Package 4+1 for free - save up to 2100 Kč! Plain and simple: healthy skin. And healthy skin is beautiful skin. Being proactive and looking after your skin on a regular basis will help slow down the signs of aging, keep your skin clear, healthy and nourished. It is also important to maintaining your at-home skin care regime. Facials are definitely worth it. Once monthly facials are recommended but of course it depends on your skin sensitivity. A facial once in a month helps aid in the cell turnover process which happens approximately every 30 days. As we age, this cell turn over process slows down, contributing to dull sallow looking skin, fine lines, wrinkles, blackheads, congestion, and coarsely textured skin. Monthly facials assist your body in doing more efficiently what it is "supposed" to do on its own.